Explore materials and tasks you can use immediately with your students. 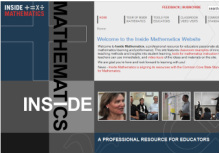 Inside Mathematics has aligned our tasks and assessment resources with the Common Core State Standards for Mathematical Content. Note that you can make use of these standards through searching by grade level as well as by progression, so we have provided two routes through these tasks and other resources.